Increase the longevity of your engine – monitor your Exhaust Gas Temperature (EGT) with a digital pyrometer AND use an auxiliary fuel filtration system. Diesel engines are not indestructible and proper care and maintenance keeps these vehicles running, now and well into the future. It is obvious that excessive EGT’s can cause damage, yet strangely, no vehicle comes equipped with a pyrometer as standard equipment to monitor levels. EGT levels are especially important in situations of load, such as towing. Damage from excessive EGT’s caused when the vehicle is labouring will not occur immediately, but like all instances of ‘metal fatigue’ can create problems over time. Why install an EGT Monitor? What is an EGT Monitor? The EGT monitor consists of a temperature sensing probe (thermocouple) which reads the heat coming from the piston area of the engine. This is the only method of monitoring the amount of ‘hurt’ your engine is going through when under load. It is an inexpensive upgrade that allows the driver to keep his engine out of EGT trouble and can be a valuable guide to optimum fuel economy. 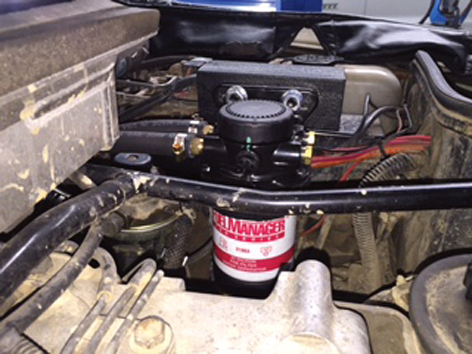 Why install an Auxiliary Fuel Filter? Fuel contamination can stop a vehicle in its tracks, and be very expensive. Standard fuel filters do filter well but, if you have water or particle contamination, factory filtration overflows and contamination enters into the system. This risk factor of fuel contamination from water is high with diesel, not because of the fuel quality, but mostly due to poor filtration at the Fuel Bowser! Auxiliary fuel filtration allows constant emptying of the filter, even if you have taken a large quantity of water and with patience you can filter it completely out of the system without damage. The auxiliary filter is treated as the ‘Sacrificial Lamb’ and takes most of the hit prior to the factory filter which then completes the finer level of filtration. This upgrade is wise for either city or country drivers. Article kindly provided by Turbo Engineering.